Investing in Canada can be done through mutual funds. 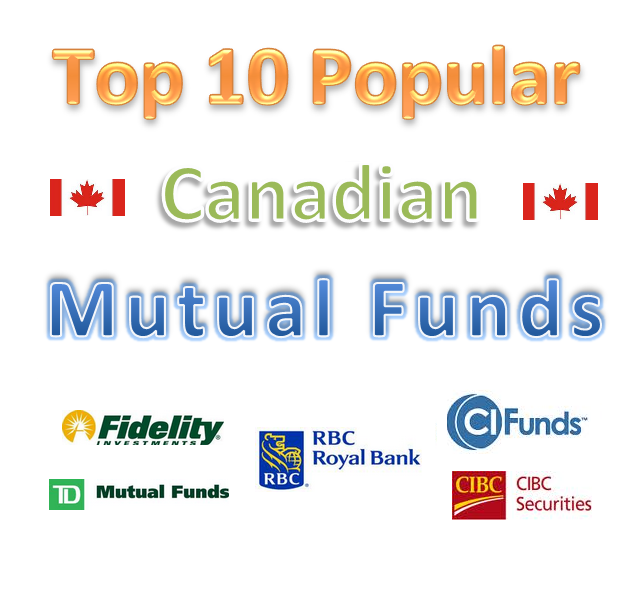 The following is Top 10 Popular Canadian Mutual Funds. These funds include: Fidelity Canadian Asset Allocation Ser B, Investors Dividend Cm RBC Canadian Dividend, TD Canadian Bond I, CI Harbour Growth & Income, RBC Monthly Income, and more. Please check back for more popular and best investment funds on my website. They provide consistent performance return such as providing regular income, capital appreciation, or total return. These funds can withstand any market conditions better than other funds such as economic crisis, bear market, bull market, etc. They are typically managed by well-known managers. The fund managers usually have managed these funds for a while. These funds have large assets. Large assets mean investors are confident in investing in these funds. They are recognized by financial magazines or websites such as Morningstar, The Globe and Mail, Lipper, etc. As the most popular investment fund, this Fidelity Canadian Asset Allocation fund's objective is to achieve high total investment return. This balanced fund uses an asset allocation approach. It invests mainly in a mix of Canadian equity securities or stocks, fixed income securities or bonds, and money market instruments. It may also invest in foreign securities to take advantage of market opportunities. This Fidelity Canadian Asset Allocation Series Fund manager is Robert Swanson since April 2006. This fund has 2.24% of annual expense ratio. There is no 12b1 fee or front-end sales load fee for this fund. The total net asset of this fund is $13.4 billion. It currently has 1.09% dividend yield. Morningstar has rated this Canadian investment fund with 4-stars rating. This top fund has -3.93% YTD return. Since its inception, this fund has recorded 13 years of positive return. The best achievement occurred in year 2009 with 24.81%. It also has 3 years of negative return and the worst performance occurred in year 2008 with -19.26%. The performance of this mutual fund based on the load adjusted returns is 11.87% over the past year and 5.99% over the past ten years. Should you are interested to invest in this Canadian fund; you will need 500 CAD for either regular brokerage or IRA account. Investor will need 50 CAD minimum for subsequent investment. The other series of this Fidelity Canadian Asset Allocation Series Fund are Series A, Series T5, Series T8, Series S5, Series S8, Series F and Series O. 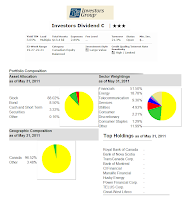 Please take note that there is other quite similar fund in Fidelity, which is Fidelity Canadian Asset Allocation Class. The top ten investments of this fund as of May 2011 are Cash & Cash Equivalents, Toronto-Dominion Bank, Suncor Energy, Potash Corp of Saskatchewan, Canada Housing Trust No.1, Cenovus Energy, Bank of Nova Scotia, Goldcorp, Canadian Imperial Bank of Commerce and Enbridge. There are total 701 investments and these top ten investments make up 29.8% of the total fund. Principal Risks of this fidelity fund include Credit risk, Equity risk, Interest rate risk, etc. More details can be found from the fund's prospectus and website. The Investors Dividend fund seeks to provide above-average income yield on its investments, protect the value of its investments, and achieve long-term capital appreciation consistent with the fulfillment of the first two objectives. This Investors Group mutual fund has been introduced to public since March 1962. The current lead fund manager is Dom Grestoni. He has been managing this fund since April 2003. This fund is categorized in Canadian Equity Balanced category. It also has a yield of 3.65% per year and the annual expense ratio is 2.89%. This fund has 21.29% annual holdings turnover rate. The current total net assets are $13.40 billion. Since its inception, this equity fund has recorded 37 years of positive return and 11 years of negative return. The best 1-year total return was achieved in year 2009 with 25.76% and the worst performance was occurred in year 2008 with -22.50%. This fund has returned 13.23% over the past year and 5.27% over the past ten years. The Morningstar has given this Investors Dividend fund with 3-stars rating. The YTD return of this fund is -2.18%. The other classes of this fund are Class A and Class B. The Dividend-A class has 2.69% of expense ratio. 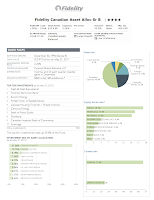 The top holdings of this fund as of May 2011 are Royal Bank of Canada, Bank of Nova Scotia, Trans Canada Corp, Bank of Montreal, CI Financial, Manulife Financial, Husky Energy, Power Financial Corp, TELUS Corp and Grest-West Lifeco. The top sector weightings as of May 2011 are Financials (51.50%), Energy (18.78%), Other (11.99%), Telecommunication Services (9.30%), Utilities (4.93%), Consumer Discretionary (2.21%) and Consumer Staples (1.29%). 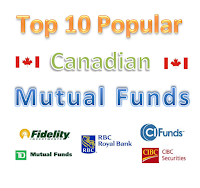 As one of the big mutual fund firm, RBC offers several popular mutual funds. RBC Canadian Dividend fund is one of this investment fund. RBC Canadian Dividend fund seeks to achieve long-term total returns consisting of regular dividend income, which benefits from the preferential tax treatment given to dividend income, and modest long-term capital growth. 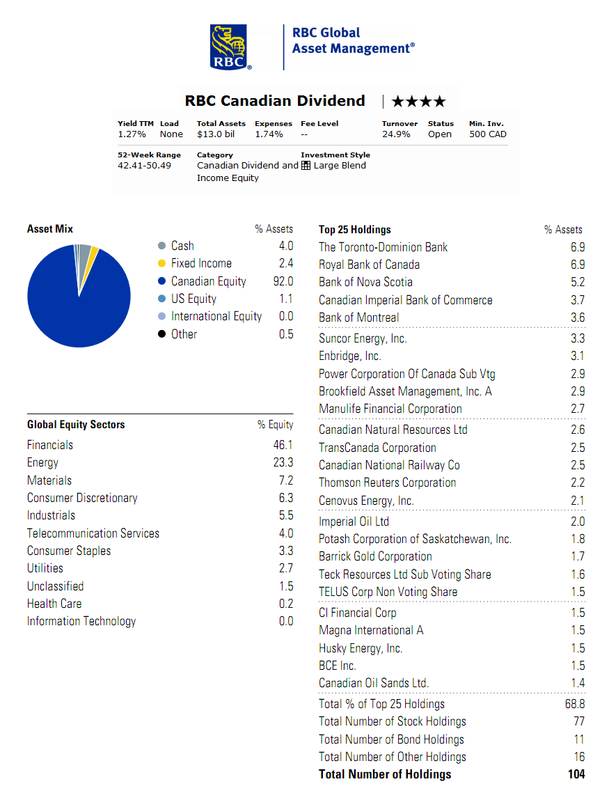 This RBC fund invests mostly in common and preferred shares of major Canadian companies with above average dividend yields. This RBC Canadian Dividend fund is categorized in the Canadian Dividend and Income Equity category. As mentioned, this fund is managed under the management of RBC Global Asset Management Inc. The inception date of this fund is January 1993. Stuart Kedwell has managed this fund since April 2007. Currently, the fund's dividend yield is 1.27% per year. The expense ratio rate of this fund is 1.74%. This fund has 4-stars Morningstar rating. It has returned 18.02% over the past year, 2.75% over the past three years and 8.32% over the past ten years. This fund has recorded 14 years of positive return and 3 years of negative return. The best achievement was achieved in year 1997 with 35.38%. It currently has -2.90% YTD return. The three years beta of this fund is 0.78. The benchmark of this fund is S&P/ TSX Composite. 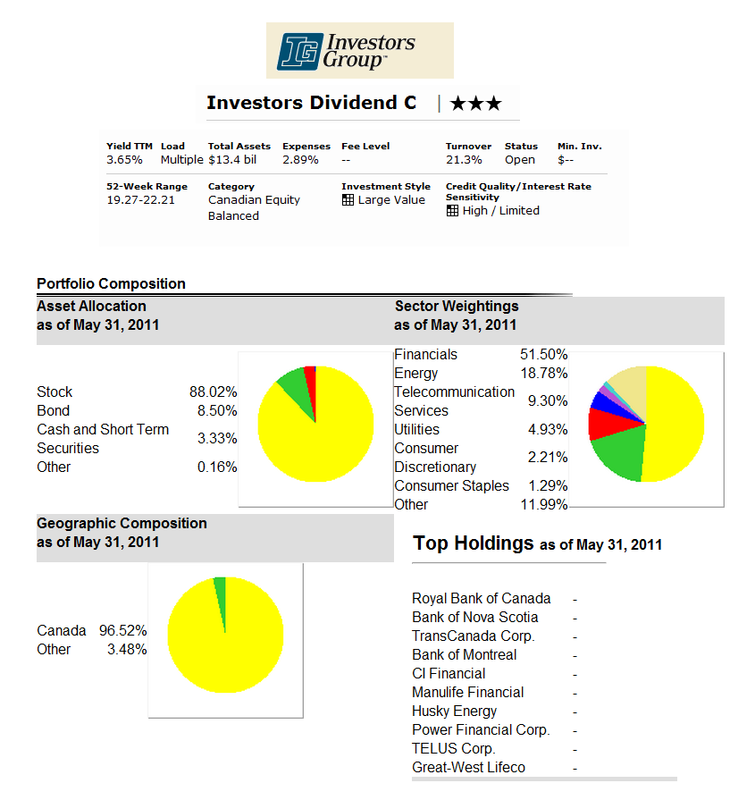 The asset mix of this fund as of June 2011 is 92.0% in Canadian Equity, 4.0% in Cash, 2.4% in Fixed Income, 1.1% in US Equity and 0.5% in Other. The top ten holdings are The Toronto-Dominion Bank (6.9%), Royal Bank of Canada (6.9%), Bank of Nova Scotia (5.2%), Canadian Imperial Bank of Commerce (3.7%), Bank of Montreal (3.6%), Suncor Energy Inc (3.3%), Enbridge Inc (3.1%), Power Corporation of Canada Sub Vtg (2.9%), Brookfield Asset Management Inc A (2.9%) and Manulife Financial Corporation (2.7%). This total holdings of this fund are 104, consists of 77 stock holdings, 11 in bond holdings and 16 in other holdings. Listed as the forth popular fund, this TD Canadian Bond fund invests primarily in high quality bonds and other debt issued by Canadian governments and companies. Up to 30% of the fund may be invested in foreign securities. 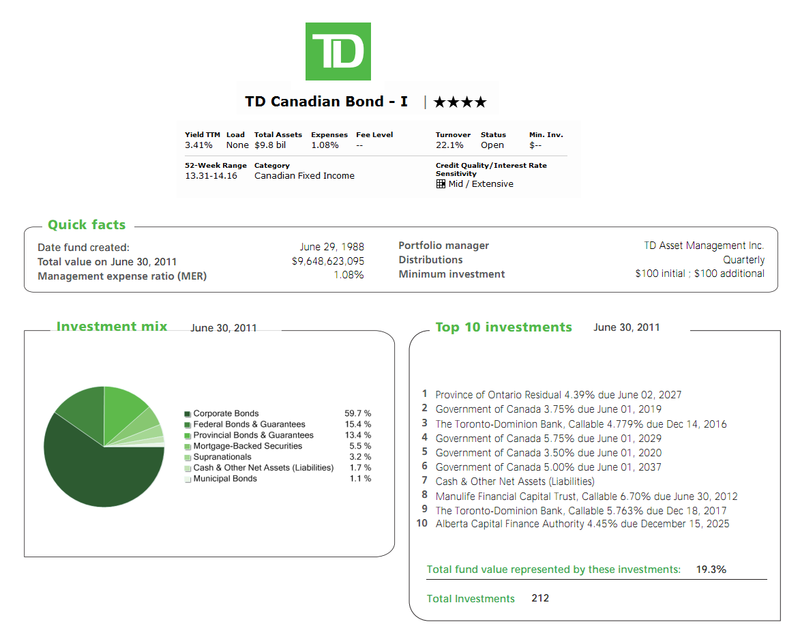 This TD Canadian bond fund was created and introduced to public in June 29, 1988. This fixed income fund is managed by TD Asset Management Inc. This fund provides dividend yield of 3.41%. This dividend is distributed quarterly. There is 1.08% Management Expense ratio if you are investing in this Toronto Dominion fund. This fund is classified as Canadian Fixed Income investment fund. As of July 2011, this fund has total assets of C$ 9.84 billion. The minimum amount to invest in this fund either in non-RSP investment or RSP investment is $100. The minimum subsequent investment applies for both investments ($100). Morningstar has ranked this fund with 4-stars return rating. It has 5.82% YTD return. This best fund has returned 6.79% over the past year and 6.22% over the past ten years. For YTD, this fund is on the 9% rank in the Canadian Fixed Income Category. 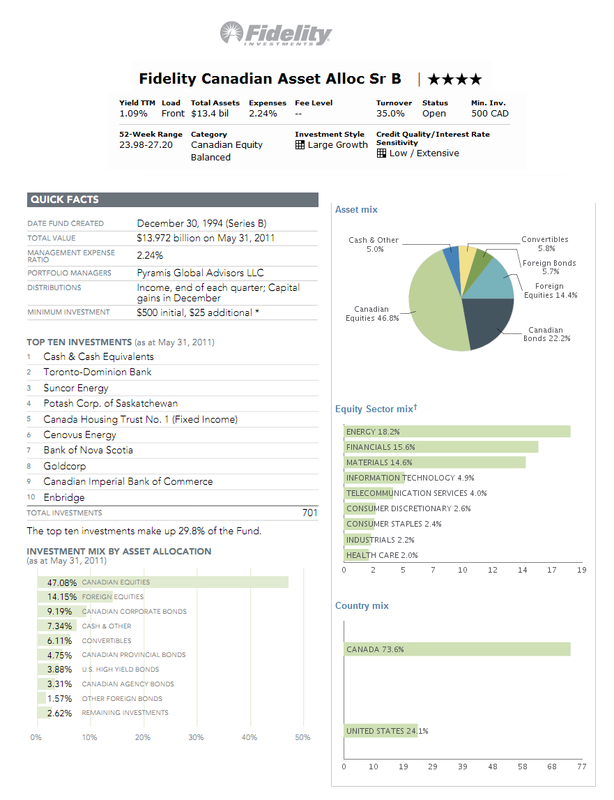 The benchmark of this fund is BofA Canada Board Market TR CAD. The top investments of this fund as of June 2011 are Province of Ontario Residual, Government of Canada, The Toronto-Dominion Bank, Government of Canada, Cash & Other Net Assets, Manulife Financial Capital Trust and Alberta Capital Finance Authority. The top ten investments out of total 212 investments represent 19.3% of total fund value. The investment assets as of June 2011 are allocated as follow Corporate Bonds (59.7%), Federal Bonds & Guarantees (15.4%), Provincial Bonds & Guarantees (13.4%), Mortgage-Backed Securities (5.5%), Supranationals (3.2%), Cash & Other Net Asses (1.7%), and Municipal Bonds (1.1%). This CI Harbour Growth & Income fund's objective is to obtain long-term total return through a prudent balance of income and capital appreciation. It invests primarily in equity and equity-related securities of mid- to large-capitalization Canadian companies and fixed income securities issued by Canadian governments and companies. The proportion of the fund's assets invested in equity and fixed income securities may vary according to market conditions. Any change to the investment objective must be approved by a majority of votes cast at a meeting of unit holders held for that reason. As part of CI Financial Group advisor, Gerald Coleman has been managing this CI fund since its inception in June 1997. This fund is in the category of Tactical Balanced fund. This fund doesn't share any dividend yield and the annual expense ratio is 2.40%. The total net asset of this fund is $8.9 billion. This equity fund has performed in the past 13 years with 11 years of positive return & 2 years of negative return. This fund's best 1-year total return was achieved in year 2009 with 21.20%. Based on the load adjusted return, this fund has returned 13.9% over the past year and 3.0% over the past five years. Besides Class A, this fund is also available in Class F and Class I. As of July 2011, the top ten holdings of this fund represent 35.36% of the total portfolio. They are Suncor Energy, Tim Hortons, BHP Billiton Limited, Canadian National Railway, Intact Financial, Potash Corp. of Saskatchewan, TD Bank, Bank of Nova Scotia, Manulife Financial, and JP Morgan Chase & Co. The asset allocation of this fund is Canadian Equity (49.3%), Cash (18.7%), United States Equity (16.6%), International Equity (10.3%) and Bond (5.1%). 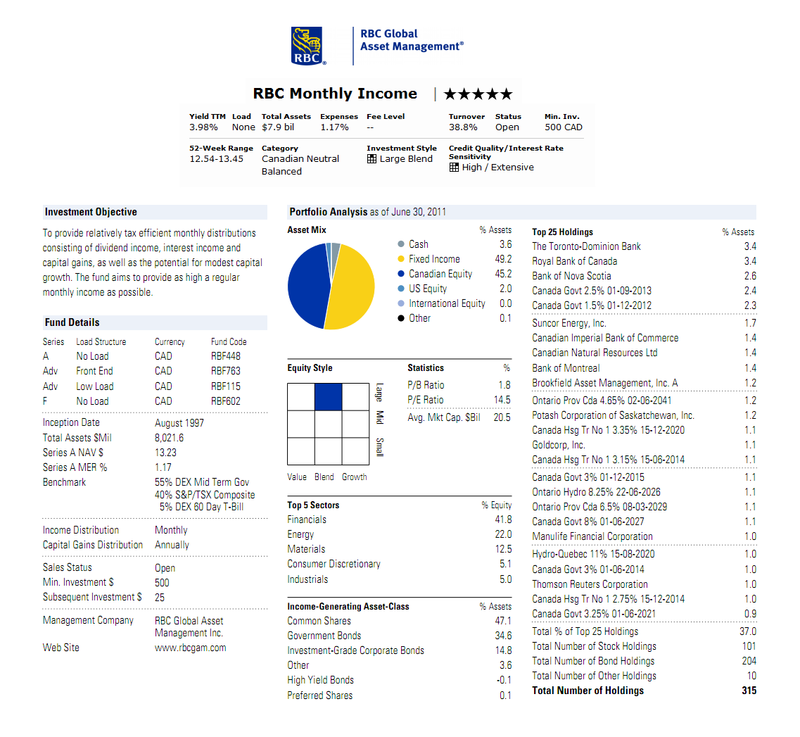 As the second RBC mutual fund in this popular fund list, the RBC Monthly Income fund seeks to provide relatively tax efficient monthly distributions consisting of dividend income, interest income and capital gains, and the potential for modest capital growth. The fund will try to provide a high regular monthly income. Money Market Fund This RBC fund has been managed by Jennifer McClelland since April 2007. She is the Vice President and Senior Portfolio Manager of Canadian Equities. The fund's inception date was on August 18, 1997. This fund shares 3.98% dividend yield per year. The income distribution is on monthly basis. The capital gain is distributed annually. The annual expense ratio rate is 1.17%. This fund has annual holdings turnover rate of 38.8%. The total net asset is $7.9 billion. 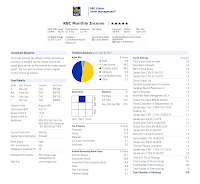 Morningstar gave this RBC Monthly Income fund with 5 stars rating. Since its inception, this RBC investment fund has 11 years of positive return and only 2 years of negative return. The best achievement of 1-year total return was achieved in 2000 with 19.77%. Based on the load adjusted return, this fund has returned 7.68% over the past ten years, and 4.22% over the past three years. This fund is Series A with no Load. Investor may choose from the other series of this fund, such as Series Advisor with Front End load (Code: RBF763), Series Advisor with Low Load (Code: RBF115) and Series F with No Load (Code: RBF602). The top 5 sectors of this fund as of June 2011 are Financials (41.8%), Energy (22.0%), Materials (12.5%), Consumer Discretionary (5.1%) and Industrials (5.0%). The top 25 holdings of this fund represent 37.0% of the total portfolio. This RBC fund has a total of 315 holdings as of June 2011 that consists of 101 stock holdings, 204 bond holdings and 10 other holdings. The RBC Balanced fund objective is to provide a combination of capital growth and modest income. This RBC fund invest majority of assets in a balance of Canadian equities or stocks, bonds (fixed incomes), and short-term debt securities. This RBC fund was introduced to public in September 1987. The annual expense ratio of this fund is 2.30%. To start investing in this fund, you will need a minimum investment of $500 with the subsequent investment of $25. This popular mutual fund has returned 5.84% over the past year and 3.86% over the past ten years. It has -3.45% YTD return. While popular, it only receives 2-stars rating from Morningstar. The other series of this fund are Advisor Series (with choice of Differed Sales Load or Front End Load or Low Load), F Series with No Load and T Series with No Load. 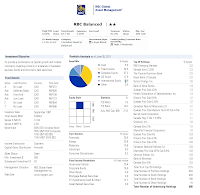 As of June 2011, the asset mix of this RBC Balanced fund is Canadian Equity (37.2%), Fixed Income (34.5%), US Equity (12.5%), International Equity (10.9%) and Cash (5.0%). The top holdings of this fund are RBC Emerging Market, Canada Government, The Toronto-Dominion Bank, Royal Bank of Canada, Suncor Energy Inc, Bank of Nova Scotia, Quebec Prov and Potash Corporation of Saskatchewan Inc. The RBC Select Conservative Portfolio fund is seeking to offer income and the potential for moderate capital growth. This RBC Select Conservative Portfolio fund invests mostly in other RBC Funds, emphasizing mutual funds that invest in Canadian fixed income securities. These RBC fund typically have the potential to generate income. As part of fund of funds, the fund's portfolio maintains a balance of investments across several asset classes for diversification. 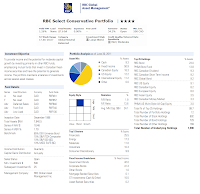 As part of RBC Global Asset Management, this RBC Select Conservative Portfolio fund was established on December 1986. The current lead manager is Sarah Riopelle. She has been with this fund since June 2009. This fund is in the category of Global Neutral Balanced fund. It shares 1.26% of dividend yield that is distributed quarterly. If any capital gains exist, it is distributed annually. This balanced fund is currently open to new investors with the minimum investment of $500 for either regular brokerage account or retirement (IRA) account. There is a compulsory of $25 subsequent investment. Investor may choose the other series of this fund. For the no load fund, there is Series F (Code: RBF657) available. For the Advisor Series, there are three options: Advisor Series with Deferred Sales Load, Advisor Series with Front End Load and Advisor Series with Low Load. Morningstar has given 4 stars rating to this fund. It also has achieved 21 years of positive return and 3 years of negative return. The best achievement was in year 1996 with 13.60%. This fund has returned 3.89% over the past decade and 2.30% over the past five years. Currently it has -0.83% YTD return. 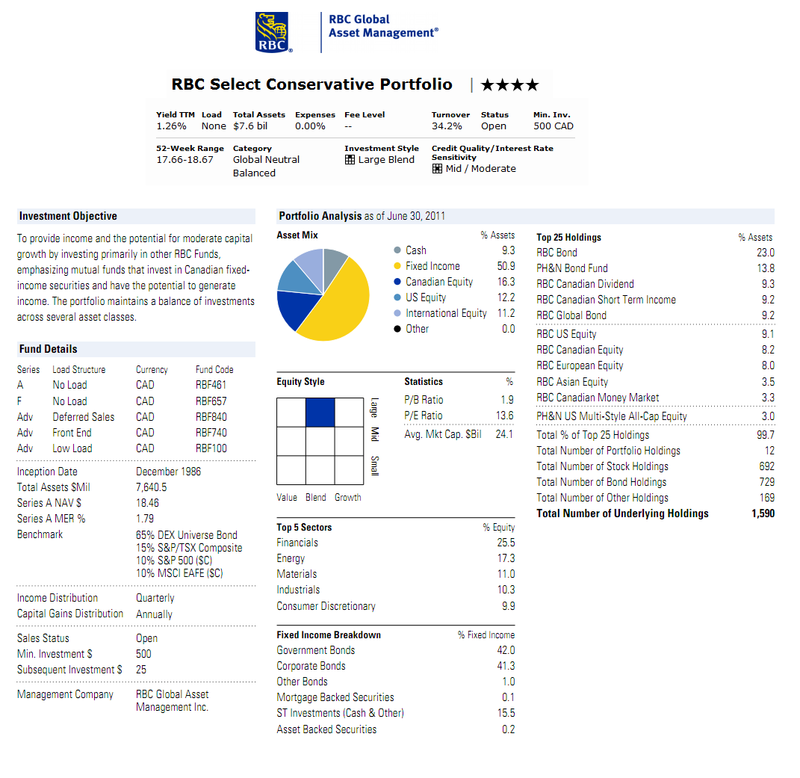 This RBC Select Conservative Portfolio fund has a total of 1,590 underlying holdings (729 bond holdings, 692 stock holdings, 169 other holdings, and 12 portfolio holdings). 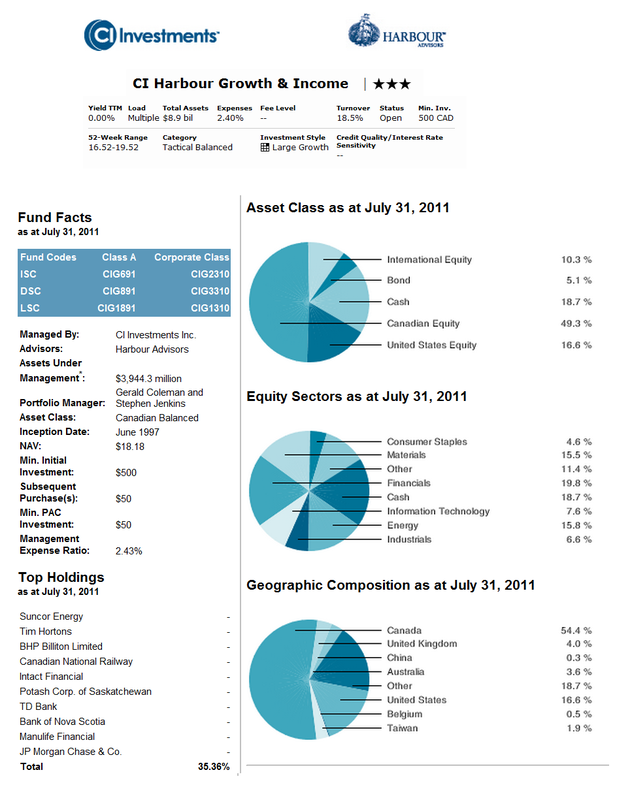 The asset mix of this fund as of June 2011 is Fixed Income (50.9%), Canadian Equity (16.3%), US Equity (12.2%), International Equity (11.2%) and Cash (9.3%). The top 5 sectors are Financials, Energy, Materials, Industrials and Consumer Discretionary. As the fifth popular RBC fund in this list, RBC Bond fund seeks to achieve above average, long-term total returns consisting of interest income and moderate capital growth. This RBC fund invests primarily in high-quality bonds or fixed incomes issued by Canadian governments and corporations. 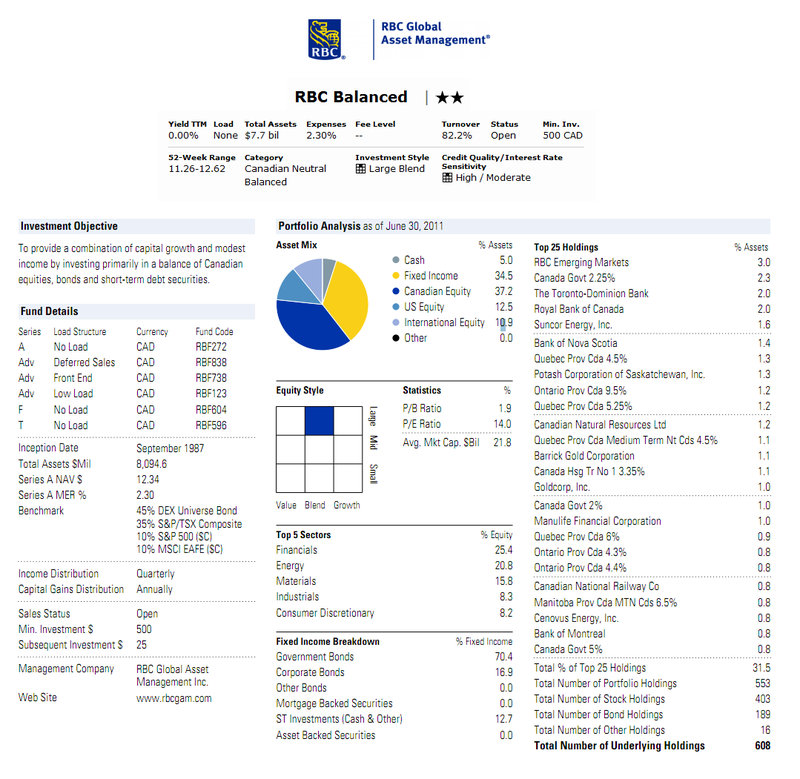 This RBC Bond Fund is categorized as one of the investment fund in Canadian Fixed Income Fund. This bond fund was introduced to public in July 1966. This fund has an annual expense ratio rate of 1.18% and it also has an annual holdings turnover rate of 45%. This fund has 3.06% dividend yield and this dividend is paid quarterly. The total net assets of this fund are $7.2 billion. The fund uses DEX Universe Bond Index as its benchmark. 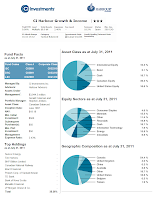 The asset mix of this fund as of June 2011 is Fixed Income (97.1%) and Cash (2.9%). The fixed income breakdown is Corporate Bonds (51.7%), Government Bond (43.7%), ST Investments (2.9%), Other Bonds (1.4%), Asset Backed Securities (0.2%) and Mortgage Backed Securities (0.1%). The top 25 holdings out of 448 total holdings of this fund represent 29.5% of the total portfolio. CIBC Monthly Income fund's objective is to provide a reasonably consistent level of monthly income while attempting to preserve capital. 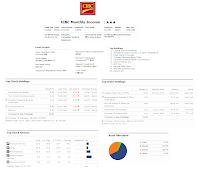 This CIBC fund invests most of the fund assets in a diversified portfolio of debt and equity instruments. David Graham has been managing this fund since December 2007. 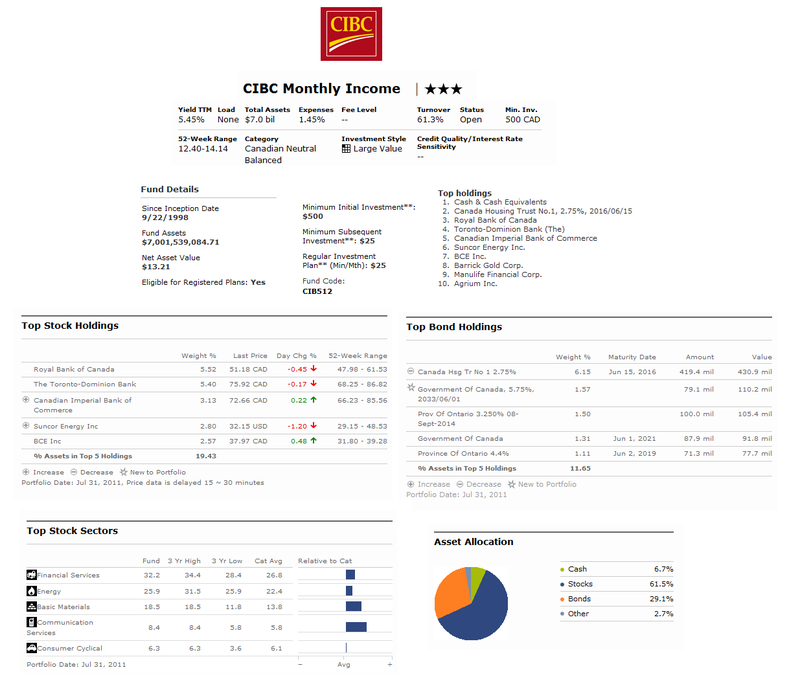 This CIBC Monthly Income fund was introduced to public in September 1998. It shares 5.45% dividend yield per year. This yield figure is the highest among the other funds in this article. The expense ratio rate is 1.45% per year. As of July 2011, the fund has total net assets of $7.0 billion. Morningstar has given 3-stars return rating to this fund. It has -2.64% YTD return. The fund has returned 6.88% over the past ten years, 2.07% over the past five years, 1.85% over the past three years and 6.48% over the past year. If you are interested to invest in this fund, you will need a minimum initial investment of $500 with $25 minimum subsequent investment. The code of this fund is CIB512. The top ten holdings of this fund as of July 2011 are Cash & Cash Equivalents, Canada Housing Trust No.1, 2.75%, 2016/06/15, Royal Bank of Canada, Toronto-Dominion Bank (The), Canadian Imperial Bank of Commerce, Suncor Energy Inc., BCE Inc., Barrick Gold Corp., Manulife Financial Corp. and Agrium Inc.